I have a new to me 71 0r 72 Speedway Blue Angel. It has an HS40-55395C Serial Number1295B. I was checking the point gap and I see there is no condenser. All of the wires seem to have a home and I have spark at the plug. Is there suppose to be a condenser in this ignition circuit? I probably should have posted this on the Tecumseh thread. I'm a newbee. Yes, it should have a condenser. There wont be any extra wires, since the condenser contains a wire with a terminal lug. It is connected to your points. Part number 30548B. Something else you should know is that the engine will run without a condenser. The purpose of the condenser is to decrease voltage across the points as they open. The condenser is there to protect the points. The other thing you should know is that these engines need to be timed to where the points open at a specific distance before top dead center of the piston. That is an adjustment found in the appropriate section of the Tecumseh manual. You can find the manual on line as a sticky here. You basically use a depth gauge to measure your piston "in the hole" and an ohm meter (or continuity tester) to ensure the points open at exactly what "in the hole" depth it is supposed to be for a particular engine. In your case, it is .035" before top dead center. The place at which the points open at is set via the "stator plate" which is that aluminum piece your magneto sits on. Loosen the two bolts and rotate it. Sorry to sound like a broke record. If you are missing the damn condenser, someone has been in there screwing around. I'd clean the points with emery cloth, get a condenser, and time it. Thanks for the informative reply. I've watched the factory tech youtube video on timing I just got stuck on the condenser issue. Thanks for the BTC setting. Back to the garage. The points were opening at .044 reset to .035 and ordered a condenser Thanks again. I think your points set at .020 , timing might be at .035 BTDC. Good Luck and you do need a condenser for sure ! You're welcome. Good job of timing it. Note the position of that condenser. You'll need that long screw that holds it as well. Got my condenser buttoned everything up. It fired right up and ran great for about 30 seconds and then gas started shooting out of a breather hole on the side of my shiny new chinese carb. That ones going back to the ebay seller tomorrow. You need to adjust the float level. Too much fuel is in the bowl, causing the engine to flood. They don't come in the mail with the proper float level set. I go for level on the Tecumseh's. You are right about that. I took the bowl off to check the float, the needle was there but the seat was missing. The poor guy is going to have more in postage than you can make on a ten dollar carburetor. On the positive side it fired right up. 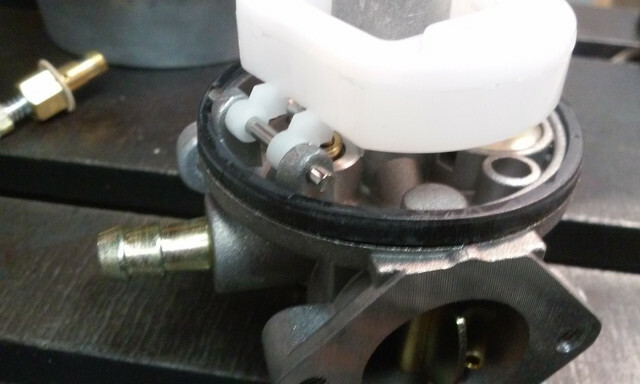 The seat is a tiny O ring that sits so far up the tiny bore there that it borders on impossible to see. That seat doesn't fall out, in fact some people even think it is not there and insert another seat on top of it. The float adjusts like all of them, with the tang which strikes the base of the needle. Like others said, just do an adjustment before you go through the trouble of sending the carb back. they often need some adjustment right out of the box. There was no seat up in that bore...just a hole at the end. It's now in a box on it's way back to new york. Amazon is sending me one, should be here tomorrow. 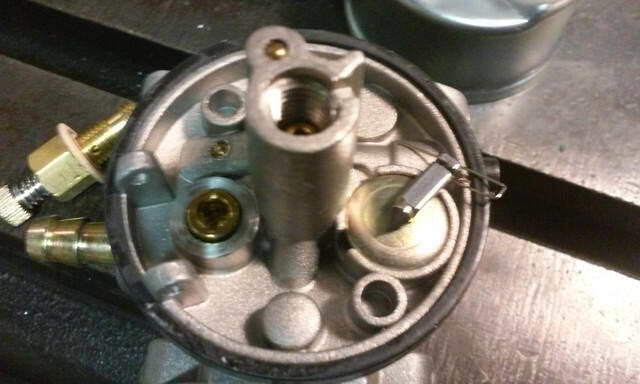 if your dealing with a china clone carb you need to take another look at your carb. they are just little different then a factory carb. they have a brass seat and a rubber tip on the needle. I think you are right about the rubber tipped needle , I don't know if I could have adjusted the problem away. I didn't expect a factory adjusted carb to shoot gas 6" out the side. With only 9.00 at stake I tend to give up quickly. Make sure your float is adjusted to it shuts off fuel when it's level. There is an actual measurement for this, but this is what I do for a stock engine. I do this and then check it with fuel flow, and lift the floats and ensure it shuts off. Makes a mess. Backfiring sounds like an air leak or timing. Sorry. If it doesn't go away with the float setting, that is where you have to look. Adjusting Chinese carbs, set both needles one turn out. Chain removed, or bike supported. Screw in throttle stop screw so it will idle high. Start the bike. If it over revs, reduce the idle a bit. You need it to be at a high idle, not running into the high speed circuit. Turn the idle mixture screw in slowly. RPM should increase as it gets leaner. Turn throttle stop screw out to lower RPM. Keep doing this back and forth until turning it one way and then the other makes it want to quit. The sweet spot. High speed setting can now be adjusted. Get it to where it will accelerate without a load, and run smoothly at half throttle. After that, I ride them, and keep adjusting until the bike will both accelerate crisply, and maintain high RPM with a load. You cant do much adjusting of the high side with the bike sitting there with no load. I appreciate you taking the time to respond. It's running pretty good now but I haven't tried it under a load. The main thing I had wrong was the throttle plate was too open to get the idle circuit to draw. I found this it was pretty helpful. Start the engine and allow it to warm up to normal operating temperature (3 - 5 minutes). Set the speed control to the HIGH position. From the recommended preset position, turn the main mixture adjustment screw in (clockwise) slowly until the engine begins to run erratic (lean). Note the position of the screw. Now, turn the screw out (counterclockwise) until the engine begins to run erratic (rich). Turn the screw in (clockwise) midway between these two positions. This will be the best setting. (counterclockwise) 1/8 turn at a time. If the engine smokes excessively (rich), turn the main adjusting screw in (clockwise) 1/8 turn at a time. After the main mixture screw is set, move the speed control to the IDLE or SLOW position. If the engine does not idle smoothly, turn the idle mixture screw 1/8 turn either in (clockwise) or out (counterclockwise) until engine idles smoothly. Yes, but that assumes you are loading it up with a lawn mower blade at the full throttle setting. You wont have that luxury with a bike, so all you can do is set idle. Also, with the Chinese carbs we've found that sometimes they like to be barely cracked open to hold a good idle. 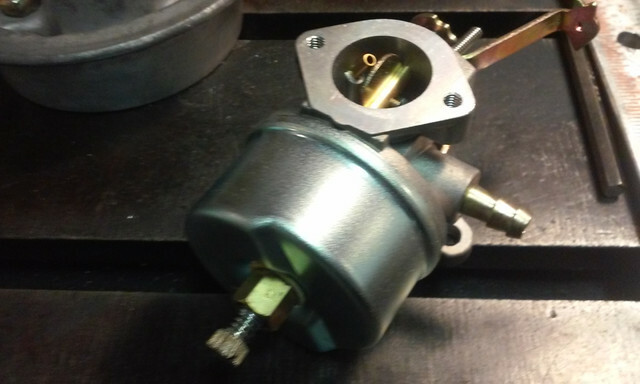 The key is keeping the RPM down low enough to adjust the pilot side without drawing from the main. Lastly, your going to want better throttle response than you would from a garden implement. Generally that involves a trade off between leaning it to get response, but having it rich enough to hold the load. Good job getting it this far. It sounds like you just about have it. Take a screwdriver with you on your first ride, so you can stop and start several times and adjust that main jet.